Precomputed Gram matrix (X’ * X), if 'auto', the Gram matrix is precomputed from the given X, if there are more samples than features. Maximum number of iterations to perform, set to infinity for no limit. Minimum correlation along the path. It corresponds to the regularization parameter alpha parameter in the Lasso. Specifies the returned model. Select 'lar' for Least Angle Regression, 'lasso' for the Lasso. If False, X is overwritten. The machine-precision regularization in the computation of the Cholesky diagonal factors. Increase this for very ill-conditioned systems. If False, Gram is overwritten. If return_path==True returns the entire path, else returns only the last point of the path. Whether to return the number of iterations. Restrict coefficients to be >= 0. This option is only allowed with method ‘lasso’. Note that the model coefficients will not converge to the ordinary-least-squares solution for small values of alpha. Only coefficients up to the smallest alpha value (alphas_[alphas_ > 0. 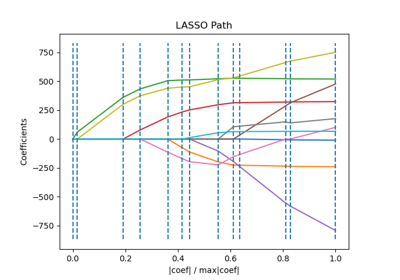 ].min() when fit_path=True) reached by the stepwise Lars-Lasso algorithm are typically in congruence with the solution of the coordinate descent lasso_path function. Maximum of covariances (in absolute value) at each iteration. n_alphas is either max_iter, n_features or the number of nodes in the path with alpha >= alpha_min, whichever is smaller. Number of iterations run. Returned only if return_n_iter is set to True.